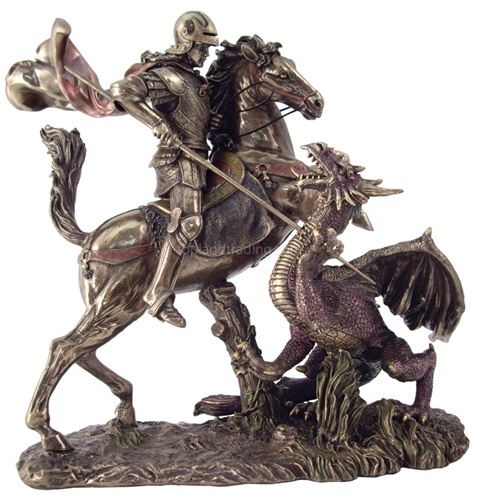 One of the famous stories written in the Golden Legend, a collection of hagiographies (stories of the lives of the saints), is that of Saint George and the Dragon. In the town of Silene, a dangerous dragon lived near the lake that provided water to the townspeople. They offered sacrifices of sheep and livestock to the dragon to keep it happy, and when that failed, they fed it their children (selected by drawing lots). When the lot fell on the king's daughter Cleodolinda, he offered the townspeople all of his riches and half the kingdom to spare the princess, but they refused. When Cleodolinda was offered to the dragon, Saint George was riding past the lake on his horse. The princess tried to send him away, but George vowed to remain. After making the sign of the cross, he charged the dragon on horseback and attacked with his lance. He called for the princess to put her girdle around the dragon's neck, and led the beast back to Silene. Saint George called out to the people, offering to slay the dragon before them if they consented to become baptised Christians. The king and townspeople of Silene converted to Christianity, and George slew the dragon- its body carted out of the city by oxen. The townspeople were baptized on the site of the dragon's death, and the king built a church to the Blessed Virgin Mary and Saint George. A spring rose from its altar, bearing water that cured diseases. Saint George is the Patron Saint of England. Cold Cast is a modern method of casting sculptures using a mixture of resin and powdered polymer materials. The finished sculpture has a surface which looks very similar to traditionally cast material, but tends to be much lighter.